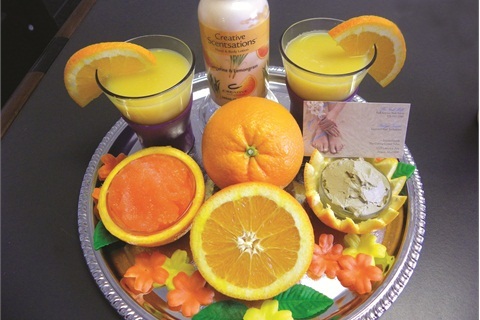 The Nail Loft uses: Be Natural Cuticle Eliminator, Callus Eliminator; La Palm Orange Sugar Scrub, Tangerine Ice Mineral Marine Mask; CND Scentsations lotion in Tangerine and Lemongrass, Solar Oil; choice of foot soak, orange-scented essential oil, base coat, polish, top coat. 1. Soak the client’s feet for 10 minutes in warm water with your foot soak of choice and a few drops of orangescented essential oil. Prepare a chilled glass with Orange Spritzer (orange juice, Sprite, and an orange slice for garnish) and serve to the client. 2. Prep nails, including applying Be Natural Cuticle Eliminator before pushing back the cuticles. 3. Exfoliate the client’s feet and lower legs with La Palm Orange Sugar Scrub. 4. Lessen calluses with Be Natural Callus Eliminator and a callus smoother. 5. Apply La Palm Tangerine Ice Mineral Marine Mask to the client’s feet, then wrap the feet in towels for about seven minutes. (This is a good time to ask the client if she wants a spritzer refill and to prepare the toe separators and pedicure slippers.) Remove the mask. 6. Massage the client’s feet and lower legs with CND Scentsations lotion in Tangerine and Lemongrass. 7. Apply base coat, two coats of polish, and top coat. Apply CND Solar Oil.